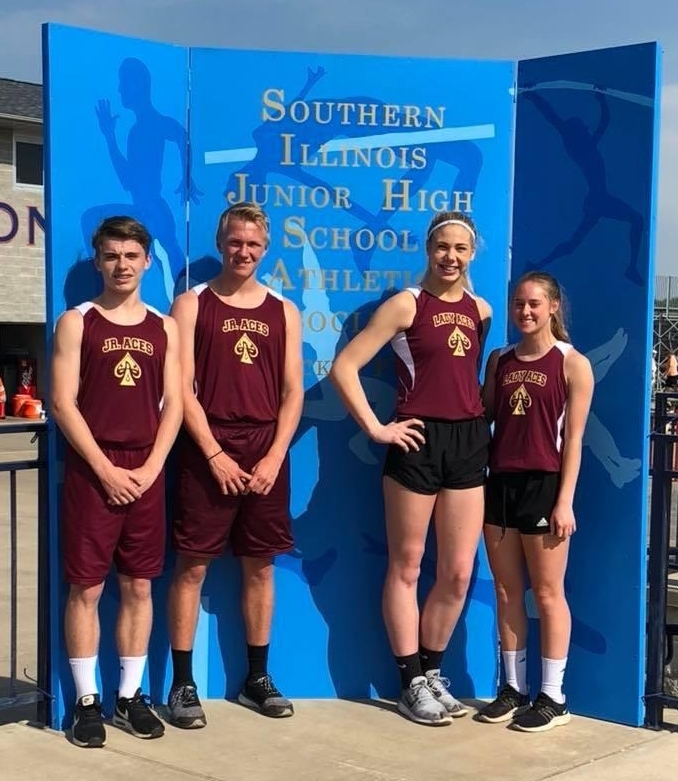 On Saturday May 12th, 2018 the SIJHSAA Class L State finals for Track were held in Carterville, IL. Going to the State Finals this year from MCJHS were four 8th Grade Athletes. Taylor Singer in High Jump and Shot Put, Flynn Guard for 100 Meter Low Hurdles, Zeke Hadra for 200 Meter Dash and Long Jump and Luke Laws for Shot Put. Taylor Singer scored 2nd Place in the High Jump with a height of 5' which is her personal best and in Shot Put she scored in 11th Place with a throw of 28' 6"
Flynn Guard scored 6th Place in 100 Meter Low Hurdles with a time of 17.17 which is her personal best. Zeke Hadra Scored in 8th Place in the 200 Meter Dash with a time of 24.69 which is his personal best and 14th in Long Jump with a jump of 17' 1"
Luke Laws scored 7th Place in the Shot Put with a throw of 40' 10" which is his personal best. Coach Hadley and Coach Judge are very proud of all of our Athletes this Track Season and look forward to seeing Taylor, Flynn , Zeke and Luke excel in their High School Athletic Careers.